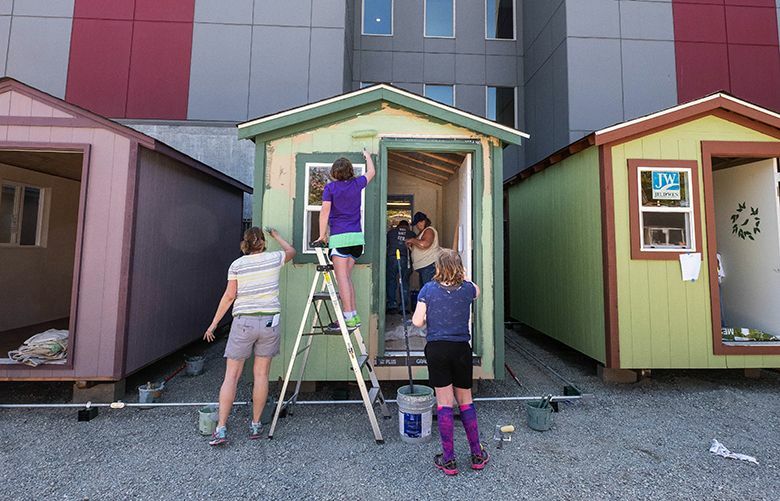 Tiny-house projects are arising as a determined response to the seemingly intractable issue of homelessness, from Kansas City to Nashville, Austin, Detroit, Seattle and upstate New York. KANSAS CITY, Mo. 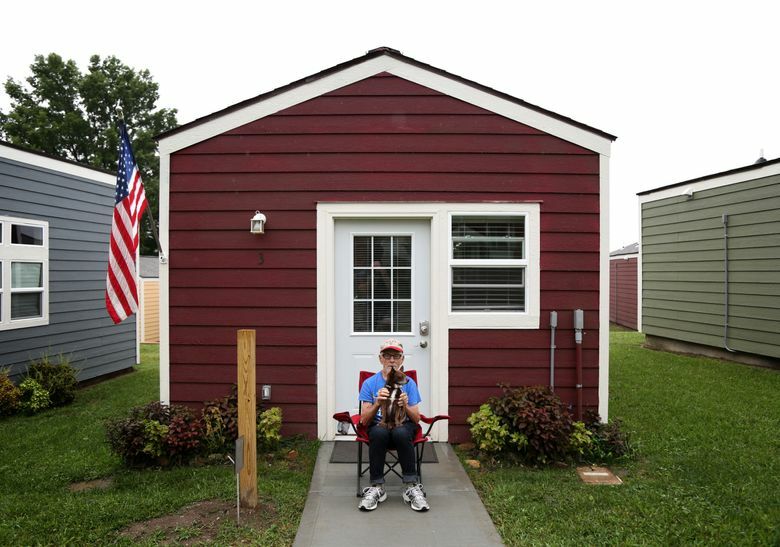 — The 13 tiny houses sit in neat rows on the small plot of land in south Kansas City. There’s a comforting uniformity to the group, each structure a simple A-frame or slant roof, painted a rich hue: deep blue or dark maroon, slate gray or mustard yellow. An American flag flies outside most of the homes. In November, the size of the “village” will double, thanks in part to a corps of volunteers and support from the city. The endeavor here is a determined response to the seemingly intractable issue of homelessness in cities nationwide — an issue often exacerbated by an extreme shortage of affordable housing and complicated by policy debates about the use of shelters and treatment programs. While the first of its kind in Kansas City, VCP mirrors the increasing number of tiny-house projects that nonprofit groups, churches and other organizations have been building in recent years — from Seattle to Nashville, from Austin to Detroit to upstate New York, where 15 “Second Wind Cottages” symbolize second chances in the small town of Newfield. “If you’re living in a tent on the street by yourself, with all your belongings, you’re not going to move into a shelter,” said Sharon Lee, the founding executive director of Seattle’s Low Income Housing Institute. “You don’t want to sleep next to someone you don’t know. You’re worried about bedbugs. You’re worried about getting your stuff stolen or being assaulted. Early on, some structures were mounted on wheels specifically to avoid zoning and building code requirements. Some are still derided as little more than “sheds with beds” — lacking utilities or other basic necessities and support — and those places are the ones more likely to face pushback, if not sharp opposition, from potential neighbors as well as some advocates. 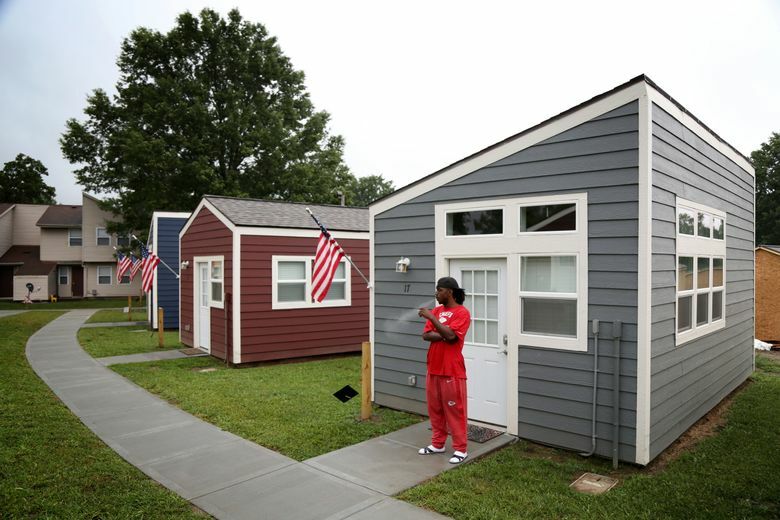 In Kansas City, the Veterans Community Project tackled fears early — with a bit of help from the moon bounces and barbecues the organization hosted for anyone interested in its housing plan, as well as the tiny-home model that the VCP took on the road. 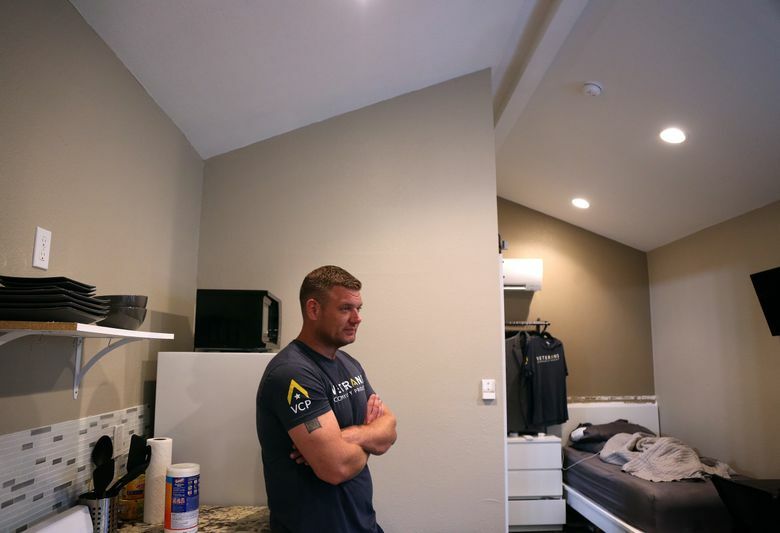 AUSTIN — A new bed and pillow are typically what most excite new arrivals at the Community First Village — even though they are likely to spend the first few nights on the floor. Graham hopes people stay permanently, and, to date, 82 percent have. A dozen died or left, and only 15 were evicted — two for breaking the weapons ban and 13 for not paying monthly rent. NEWFIELD, N.Y. – The view from each front door is natural, heavenly splendor. In summertime, the nearby hills are a lush green. Come fall, they burst with color. It is a place to heal, which is what the men living in the 15 tiny beige houses here hope to do. Welcome to Second Wind, says Carmen Guidi — and second chances. “We’re not landlords. It’s a program with a sliding fee,” the 53-year-old Guidi said recently, explaining that local social-service professionals often visit Second Wind to boost residents’ physical and mental well-being, work with them on diet and nutrition and improve their job-seeking skills. Step into a Second Wind cottage. Each is a cozy and comfortable 16 by 20 feet — about the size of a New York City studio apartment — fully equipped and insulated to protect against the Finger Lakes region’s snowy, brutally cold winters. Churches support the program. In fact, high-school students from area congregations worked side by side with Second Wind residents in late summer to install windows and doors on three structures still under construction. One house is canary yellow, with a bright-red front door. Another is a beige mini-Tudor with a stone chimney and steeply pitched roof. The lawns are neatly manicured, and last winter, the homes were outlined in Christmas lights — probably the first holiday decoration in this part of the city in decades. NASHVILLE, Tenn. — The sign on the faded strip of fence reads “Sanctuary.” And just beyond it, in the shadow of downtown Nashville, is the grassy space where about two dozen people live in tents and micro-houses. Sanctuary today features 15 houses — with space for just a bed and chair in each — and a patio and fire pit built by a Boy Scout troop. A just-completed $150,000 project added restrooms, showers and a laundry room. SEATTLE -The first thing you notice about Whittier Heights Village is the torrent of colors — the flower basket hanging outside each home, the decorative artwork hand-painted on each door. One entryway reads: Live Love Laugh.